The Chinese space station Tiangong-1 is expected to fall to Earth around April 1st, according to the latest estimate from the European Space Agency (ESA) and Aerospace Corporation which are continuously monitoring its descent. Tiangong-1 (天宫一号, Heavenly Palace 1) is China’s first space station and an experimental space laboratory. Its major goal was to test and master technologies related to orbital rendezvous and docking. It is identified by its UN COSPAR ID 2011-053A or NORAD ID 37820. The reentry has been confirmed as 2018/04/02 00:16 UTC. Reentry occurred in the Pacific Ocean. The ESA's Space Debris Office is forecasting a window centred around 23:25 UTC on 1 April (01:25 CEST 2 April), and running from the afternoon of 1 April to the early morning on 2 April. This remains highly variable. Following launch in 2011, the Tiangong-1 orbit began steadily decaying due to the faint, yet not-zero, atmospheric drag present even at 300 or 400 km altitude. This is normal and affects all satellites and spacecraft in low-Earth orbit (International Space Station is also subject to this process). During its operational life from launch through to December 2015, regular orbital maintenance manoeuvres were executed by Tiangong-1 in order to maintain an operational altitude of between 330 and 390 km above the Earth’s surface. However, in March 2016 the Tiangong-1 space station ceased functioning but maintained its structural integrity. In so far as can be fully confirmed, ground teams lost control with the craft, and it can no longer be commanded to fire its engines. It is, therefore, expected to make an uncontrolled reentry. 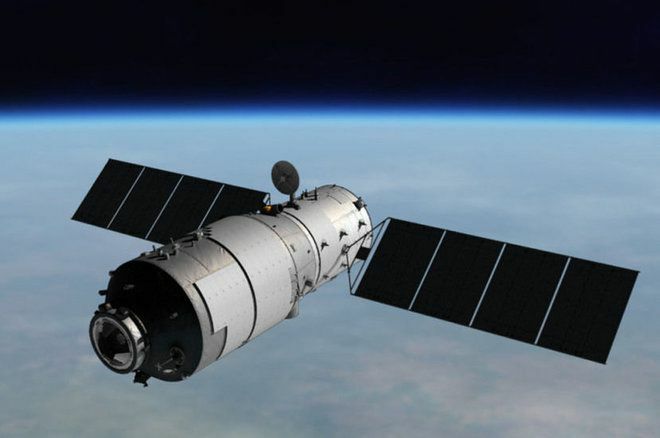 On 2016 March 21, an official Chinese statement declared that telemetry services with Tiangong-1 had ceased. 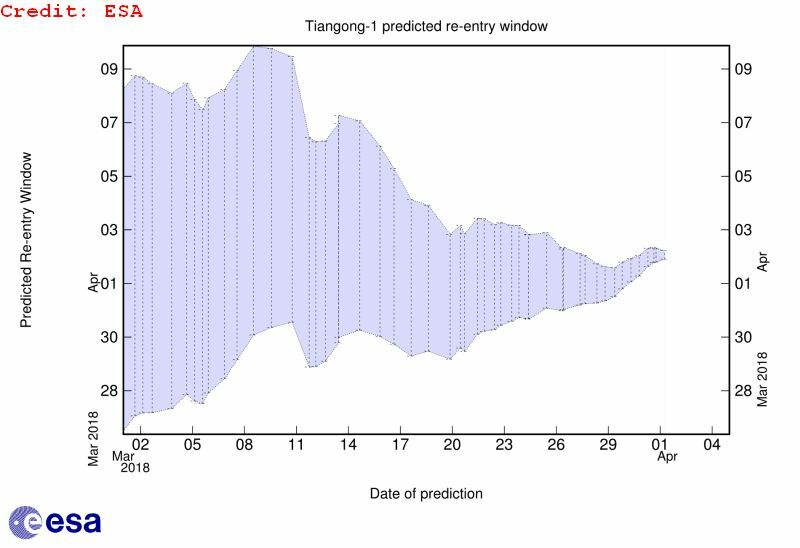 Due to the uncertainties involved it is very difficult to predict the exact timing of a Tiangong-1 reentry, as for any other decaying orbiter. There are several sources of uncertainty which include: variation in the density of the upper layers of the atmosphere, uncertainties in the orientation of the space craft over time, uncertainties in some physical properties of the spacecraft such as the exact mass and material composition, and uncertainties in the exact location and speed of the space station. According to ESA, reentry will take place anywhere between 43°N and 43°S. Areas above or below these latitudes can be excluded. Only from one day before the actual reentry will it become possible to roughly predict which ground tracks, and hence which regions on Earth, might witness the reentry. However even then, an impact location prediction on the order kilometres is, for an uncontrolled reentry, beyond current technical capabilities due to complexities of modelling the atmosphere, the dynamics of the reentering object and limitations in observing the spacecraft. In general, the uncertainty associated with an uncontrolled reentry prediction is on the order of 20% of the remaining orbital lifetime. Practically, this means that even 7 hours before the actual reentry, the uncertainty on the break-up location is a full orbital revolution – meaning plus or minus thousands of kilometers. The live tracking is the output of a celestial mechanics model implementation using as input the orbital (keplerian) elements collected from various sources. For Tiangong-1 the orbital elements are distributed by Defense Joint Space Operations Center (JSpOC). Tracking prediction is highly unreliable typically hours before the reentry due to many uncertain parameters involved in this process. The n2yo.com website welcomes donations. Your contribution will help to maintain, develop and expand the free services offering. Thank you.